Microgaming is known for the unique and the new themes of its video slots. This video slot is certainly one of those games as it combines two different popular themes together. The first one is a sportive theme that is based around soccer. The second theme is the beautiful environment of Africa. This is because the game invites players to go on a trip to African where they can watch a soccer tournament in which all African animals will be a part of. 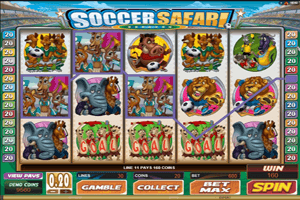 Play Soccer Safari Slot here. The symbols that land on the reels of the game and its 30 lines after players click on spin include the different animal players, the lion, the giraffe, the elephant, the tiger and the wild boar. There are also other symbols such as the cheerleading deer and the Zebra referee as well as the golden cup of the tournament and the logo of the slot machine. The game’s logo is its wild icon. So whenever the logo of the game lands on any of the reels and lines of the game, it will substitute for other non bonus symbols so it can help players earn a payout by forming a winning combo. The Scatter Golden Cup is the bonus symbol, 3 of these symbols will trigger the Go For Goal bonus through which players can earn up to 60000 coins. The Referee symbol can trigger the free spins round when it lands on the 1st and the 5th reel at the same time.